Last we left off, we’d just had the most paradisiacal and mouth-gasming cooking class of our lives and were headed off for the second part of our HCM combo tour pack. (If you haven’t read about said mouth-gasming cooking class, you can always catch up here). Feeling a tad sleepy from the food coma threatening to envelop us like fat billowing storm clouds, we nodded and attempted to keep up conversation with our extremely animated guide. “First we will go to village where we see traditional way,” she said. I wasn’t sure what “traditional way” was nor what it produced and was too out of it to ask for further specification. Ricky and I nodded and murmured in acquiescence but I think we both fell asleep because suddenly the van had stopped and she was opening the door. Before we could get out though, she said there’d be a change of plans. “They are not ready yet so we go to the rubber trees now,” she informed us. We crossed the street where tall skinny trees were all wound with blue ribbons. When we had walked just a hundred feet in or so, we stopped and she turned to us. “They cut the trees along here,” she said, indicated shallow gashes made as if by Wolverine sharpening his claws against the bark. Cuts in tree bark to get at the sap. She searched for the word in English. “Spile?” I said, catching sight of one hanging from a blue ribbon around the trunk. 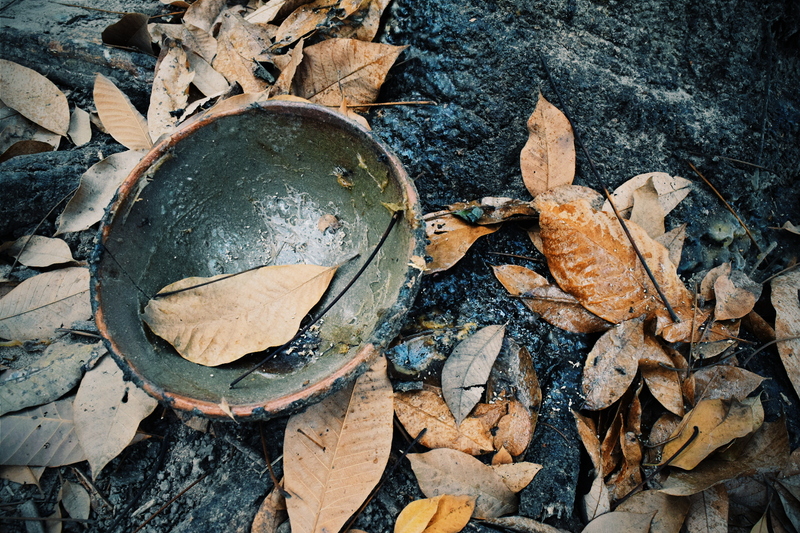 Bowl used to catch rubber tree sap. Then she whispered. “This land is actually private for the government so we can’t go too far.” But she acquiesced to take a photo of Ricky and I before leaving – which was a good thing too because it’s one of our only shots together on the whole trip. 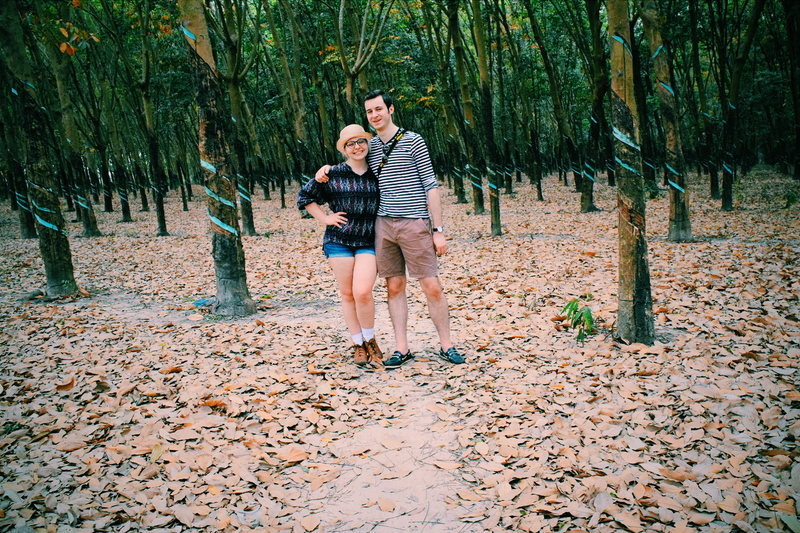 Ricky and I in the rubber tree forest. 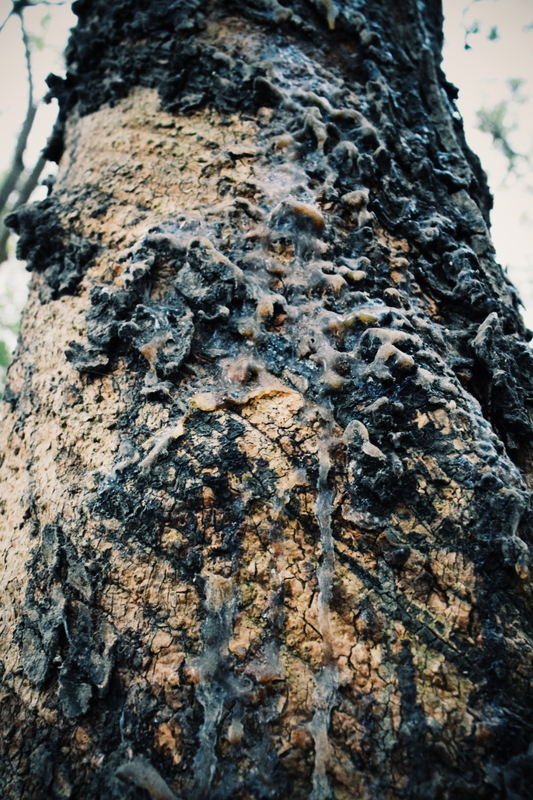 I also couldn’t help but touch some of the dried sap before we left: it felt exactly like a tire or a rubber band. Strange how I’d always imagined (even though I knew better) rubber to be akin to plastic in its artificialness, and yet here it was bleeding out of a tree. 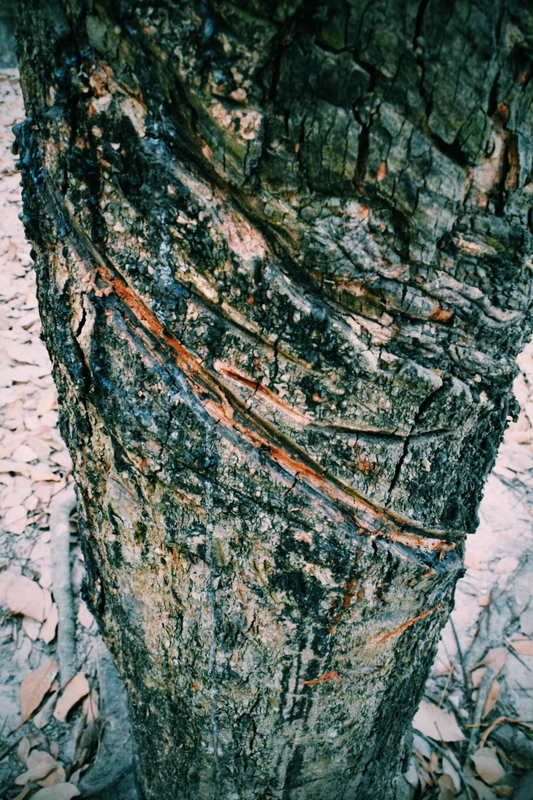 And for anyone curious about how long these trees stick around with such gashes in their sides, it’s about 20-25 years. But their lives don’t end there; they are made into mulch and then used to grow the oyster mushrooms the chef had showed us in our cooking class. It’s a pretty convenient circle of life they have set up. After that we crossed back to the small hut where they were ready for us now. It turned out what making “traditional” referred to was the translucent rice paper used for spring rolls. First our guide showed us how they refine the rice by sifting it. Ricky sifting rice grains using the man-powered machine. It’s literally back breaking stuff; you need good core muscles to keep this going all day. 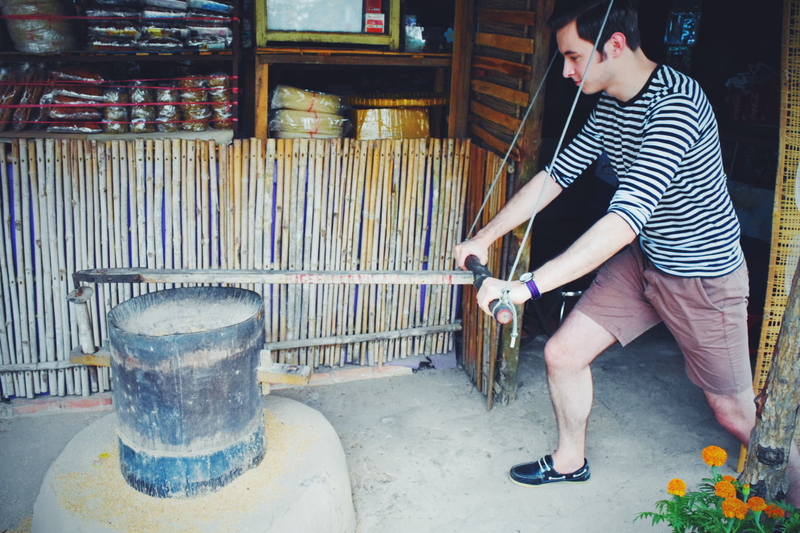 After that it goes through a grinder, and then two labourers will pound the grains into a fine powder. Finally it’s ready for mixing into a watery batter where it is steamed briefly. They let us try (a mistake in my opinion but one they encouraged us to make), so here’s me scooping up some batter. Ricky trying to maneuver the cooked rice paper to to the drying rack (it’s really hard to keep it from tearing/folding on itself). The rice paper pro! She was the sweetest woman and encouraged us to give it a shot. 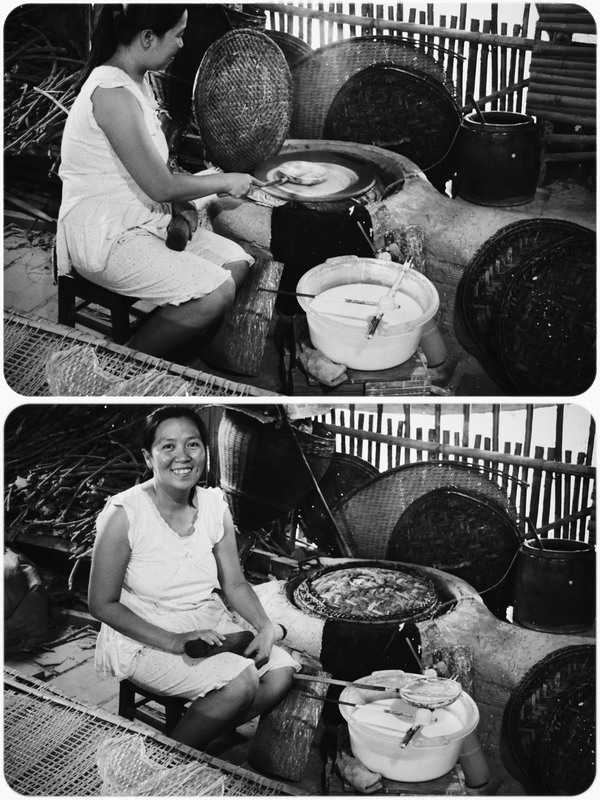 In the first picture she is spreading the batter across the pan; after that, the thatched lid goes down to steam it. Once cooked (in a matter of a minute or so), it is laid to dry on a woven bamboo surface. So if you’ve ever wondered why it has crosshatched patterning on it when it’s dry, it’s because of this. 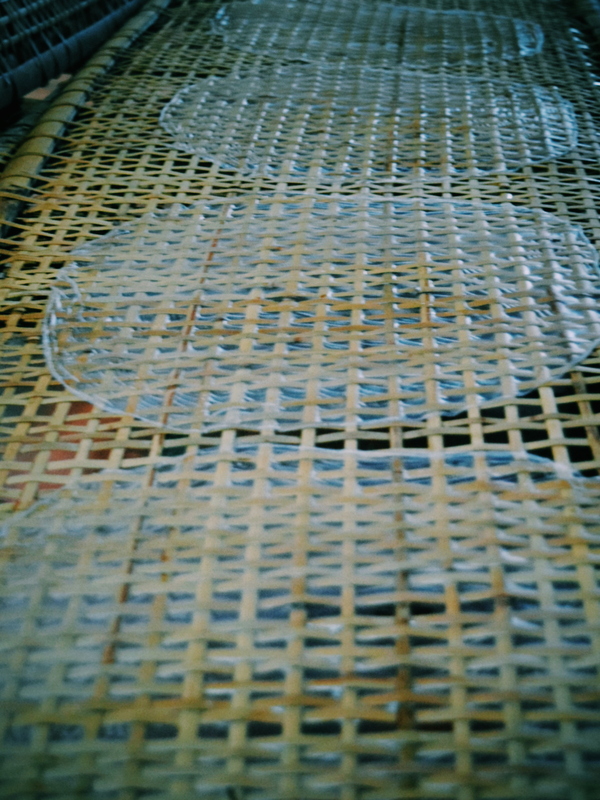 Rice paper laid to dry. Soon after we pressed on and arrived at the Cu Chi Tunnels. There was an explanatory movie (which I all but slept through), but most of the information I remember was from our guide. 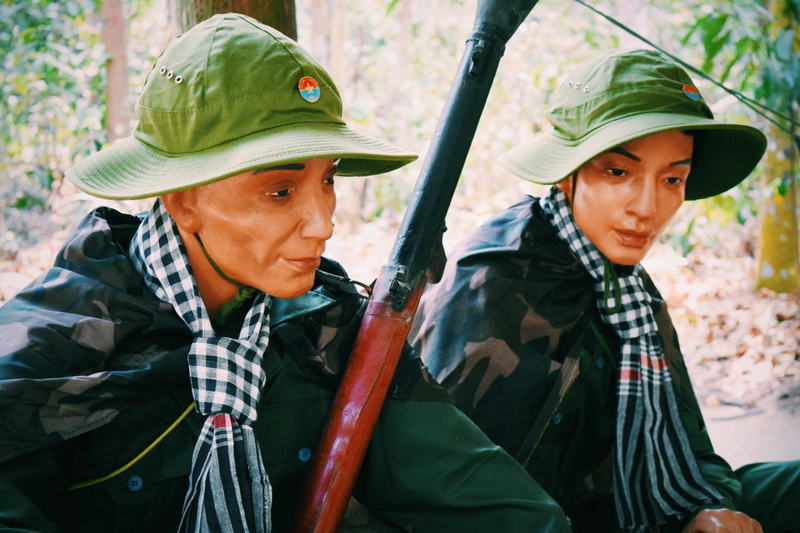 She chattered happily to us about the ingenuity of the tunnel system – how it was virtually undetectable to enemy soldiers and allowed the villagers of Cu Chi, who essentially all moved house underground, to remain protected. Using nearly every resource and advantage over the Americans they had, they constructed these tunnels with extreme deliberation. 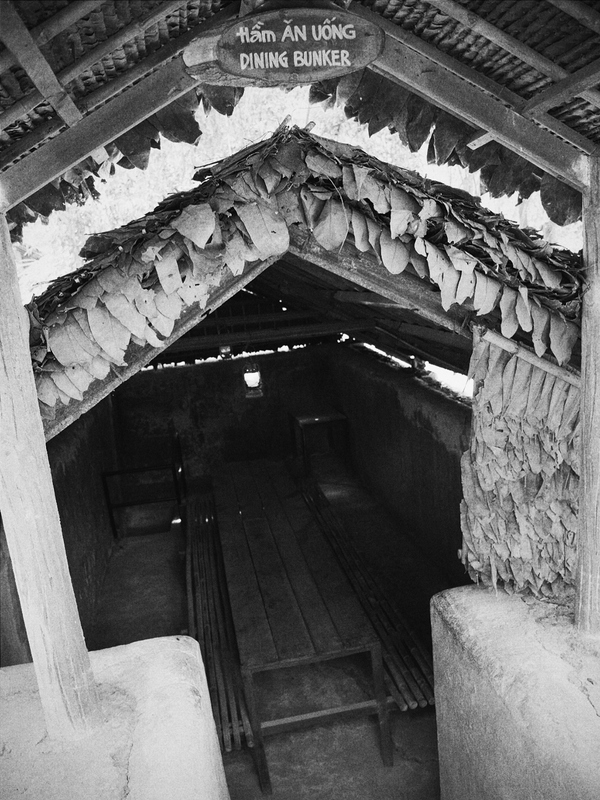 Main living chambers were constructed several feet below ground with flat ceilings, but “bomb” shelter chambers were dug in A-frame structures for maximum protection against cave-ins. Tunnel living structure. Photo from Vietnam Discovery. 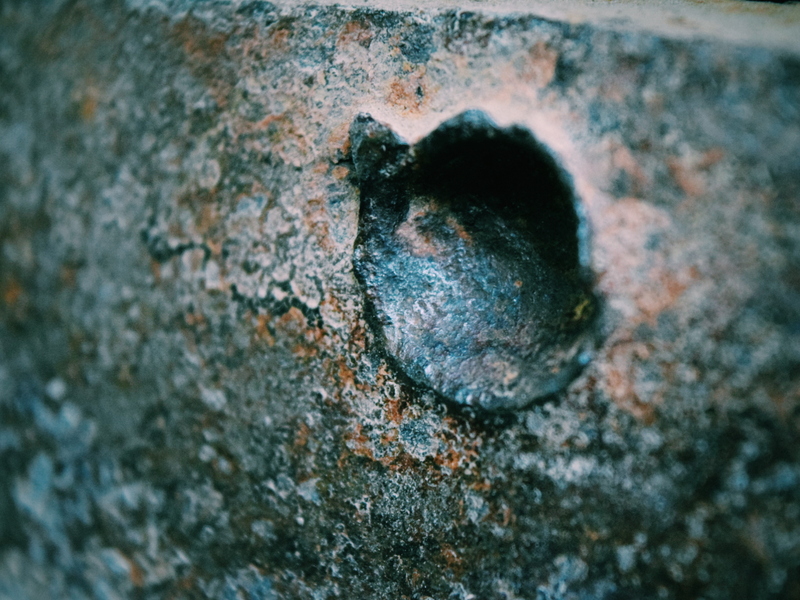 To ensure cooking smoke didn’t give away their positions, they made several conjoined smoke-diffusing chimney chambers with tiny vents leading up to the surface. They were also only allowed to cook during the morning when the smoke would blend in with the mist for maximum coverage against watchful helicopters and planes. Diarama showing ventilation chambers (4 small “window-like” ones on top), triangular anti-cave-in chamber on far left, a well dug deep down with blue at the bottom, and multiple escape route tunnels including one with squeeze space to counter the larger statures of Western soldiers (this appears as a sideways hourglass in the bottom section of tunnels). Photo from Around VN. Ventilation entrances were sprinkled with chilli pepper to keep watchdogs from sniffing it out (although this backfired in that as soon as the dogs started sneezing it was a dead giveaway. I believe they also used chilli pepper to dissuade snakes and centipedes from coming in through these entrances (though I don’t recall perfectly so if I’m wrong feel free to correct me in the comments section). Human entrances were well disguised with leaves and extremely small. May just as well try fitting into a postage stamp. Because of this, it was extremely unlikely for an enemy soldier to be able to find it on their own, let alone fit inside done up in full gear. The Vietnamese used their knowledge of the land to the fullest advantage. Ricky and I got to get inside the tunnels to see just how small and well-concealed they were. Both the guide (in her demonstration) and I got stuck and had to be pulled out by helping hands, but Ricky managed to lift himself out with his lengthy gibbon arms. We did this just in time too, because a huge crowd from a separate tour came by. As a side note, aside from one or two other tours from us, we had the place virtually to ourselves. Whether this was because it was still early in the day or Lunar New Year we didn’t know, but counted ourselves quite lucky either way. 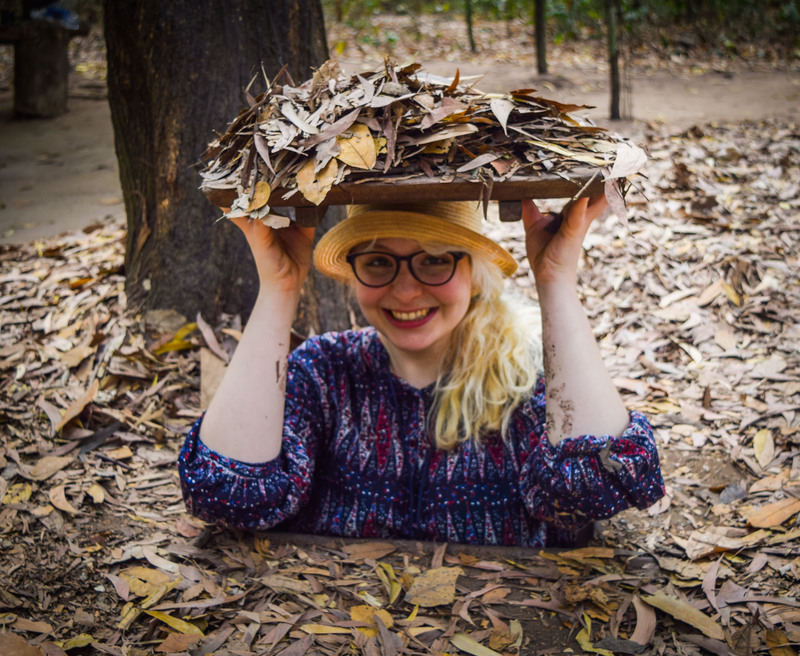 Me infiltrating the Cu Chi Tunnels. Photo by Ricky. 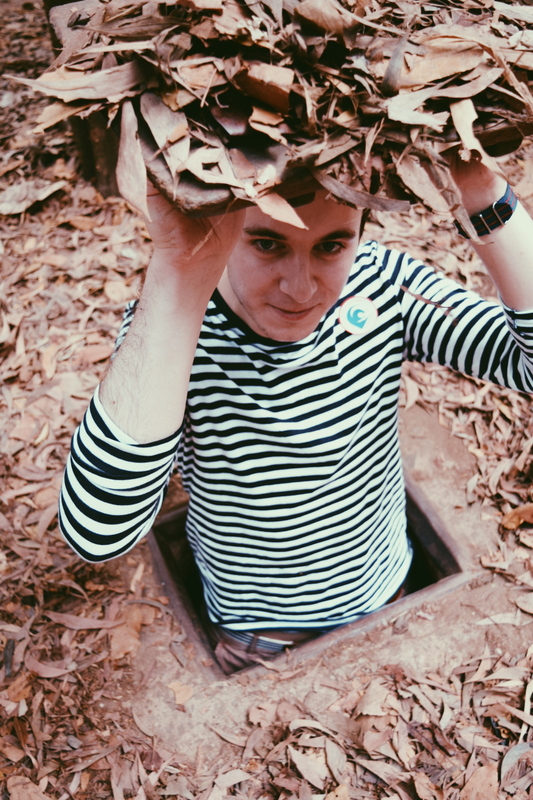 Mandatory Cu Chi Tunnel tourist shot. Anyway, as we skittered away from the other tour we continued to be enlightened about facts on the tunnels. For example, if the Americans did get in, the Vietnamese had escape tactics. 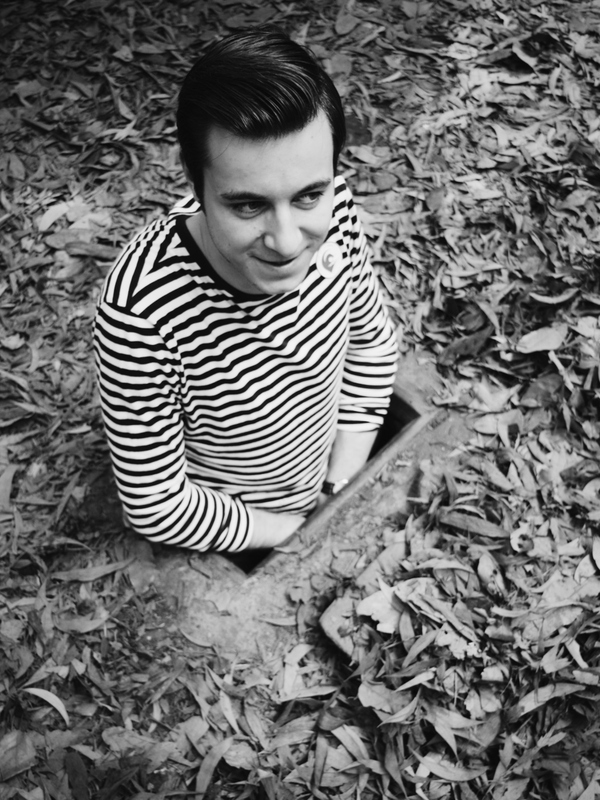 Due to their being physically smaller than Westerners, they would make crawl spaces impossible to get through for anyone of a large stature (see tunnel diorama photo above). Indeed, we tried to walk through these tunnels and even yours truly who stands barely higher than a hobbit had to walk at a 90 degree angle. Tall Ricky was doing a penguin shuffle behind me. And this is after they’ve widened it for tourists like us – the real thing was even narrower and lower. We didn’t take any photos, but here’s one borrowed from Travel Journals to illustrate the size. If they could fit anyway, the Vietnamese also had nasty metal contraptions not unlike bear traps that they’d leave behind them for the unsuspecting to run into in the dark tunnel ahead. Needless to say the results would be enough to slow down anyone in hot pursuit. The tunnel system worked along the structure of a fish spine with one main tunnel and many others spiking off from it. In this way, they all led to the same place and the ultimate entrance/exit to these tunnels was in the river. This was convenient because the Vietnamese could escape across the river and into the jungle on the opposite shore should the need arise. 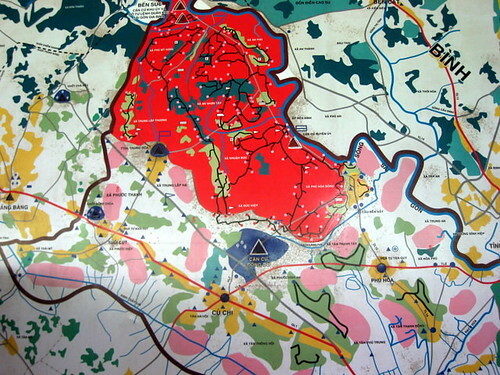 Red area indicates the extent of the tunnelling. Photo from Travvel Sized. It was more than just the tunnels though that helped them win the war: there were no holds barred when it came to the villagers protecting themselves and their families. Our guide brought us around to a “trap” display section where we were shown barbaric medieval-esque ways to get impaled by rusty nails and wires. Originally made to trap animals like wild boar and tigers, these were discovered to be just as effective at catching enemy soldiers. 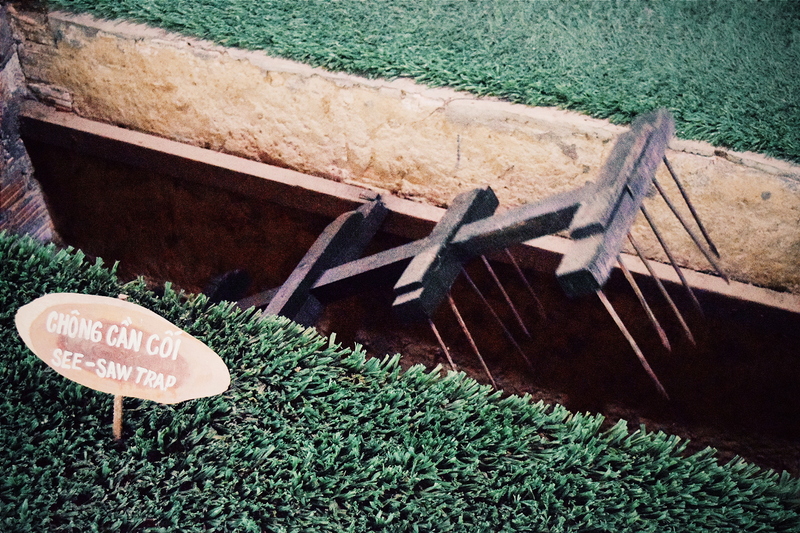 “See-Saw Trap”, a pretty self-explanatory name, albeit gruesome; if a person stepped on this, they fell in the hole and then were immediately pierced as the other end swung around to hit them in the face. 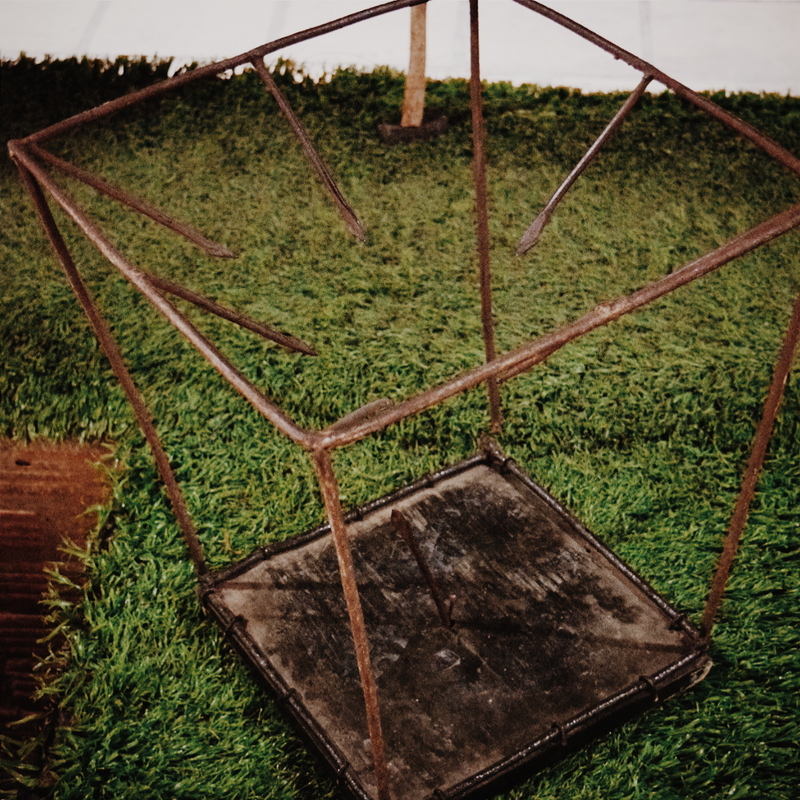 “American Souvenir Trap”, so called for the fact that any American soldier who stepped into this (with its single nail piercing through the foot from the bottom and the multiple nails pointing down to trap the leg) would be left behind for the Viet Cong as a “souvenir”. Pictures lined the opposite wall of victims in these traps. Our guide pointed to one of a young American reaching out for his friend to pull him out. It’s one of those moments that’s so serious that the only way to undercut it is through humour and for that I appreciated her attempt to keep it light. God knows we’d had quite the harrowing day already when we’d gone to the War Crimes Museum, and it’s hard to keep the sobering reality of the war from seeping in when you’re trekking through a place with such a violent history. Ahead on the path was an old American tank destroyed by a delay mine in 1970. “You can see where bullets hit,” our guide said. Sure enough, we got close enough and could see the indentations of hundreds of bullets that must have clanged into the metal with deafening rings before ricocheting off through the jungle. Bullet scar in the tank metal. 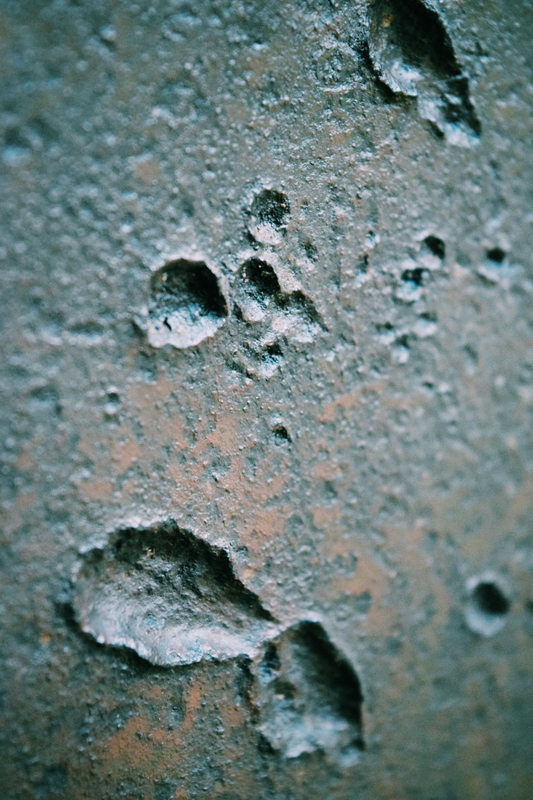 Multiple bullet marks in the tank metal. It was sometime around then that we heard the unmistakable cracks of gunfire. At first I thought it was a recording to give effect to the tour, but nope, it was genuine. I’ve never heard real gunfire before – only sound effects in movies and TV shows. 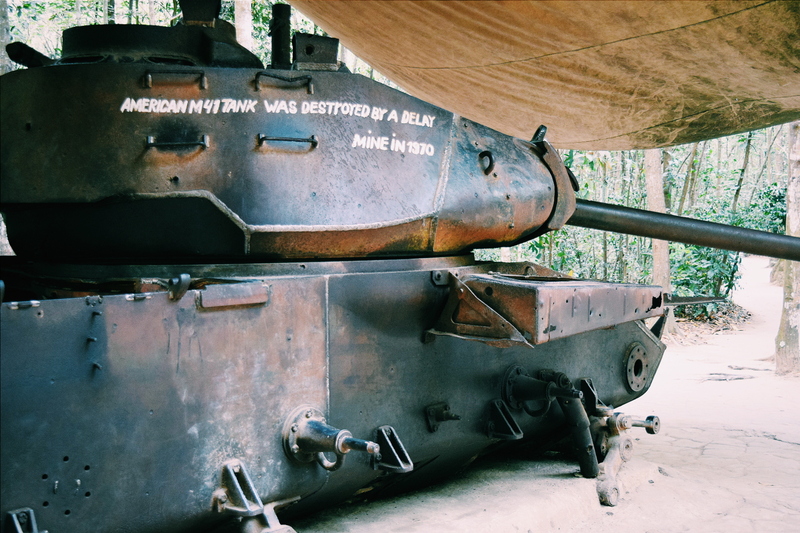 Maybe it was just the effect of the place, but seeing the broken tank, the pockmarked metal, and the stereotypical jungle backdrop that’s visually famous from every ‘Nam war movie ever made, it was a damn eerie experience. Especially with mannequins like this set up. Mannequins sporting strap-adjustable shoes made of old tires like the authentic ones they wore in the war and looking uncannily like live human beings from your peripheral vision. I imagined the jungle how it must have been back then – not peaceful and benign like now, but hiding enemies in every shadow and bamboo cluster. Even the fallen leaves were hostile, concealing brutal traps under what could be your last footstep. What must it have been like to be crouching with fellow soldiers through the trees when suddenly gunfire began to tear up the silence and you don’t know if it’s directed at you or not? It would be enough to corrode the nerves. “You want try?” asked our guide. “Hah, that’s alright,” I smiled. “I have sensitive ears,” said Ricky. 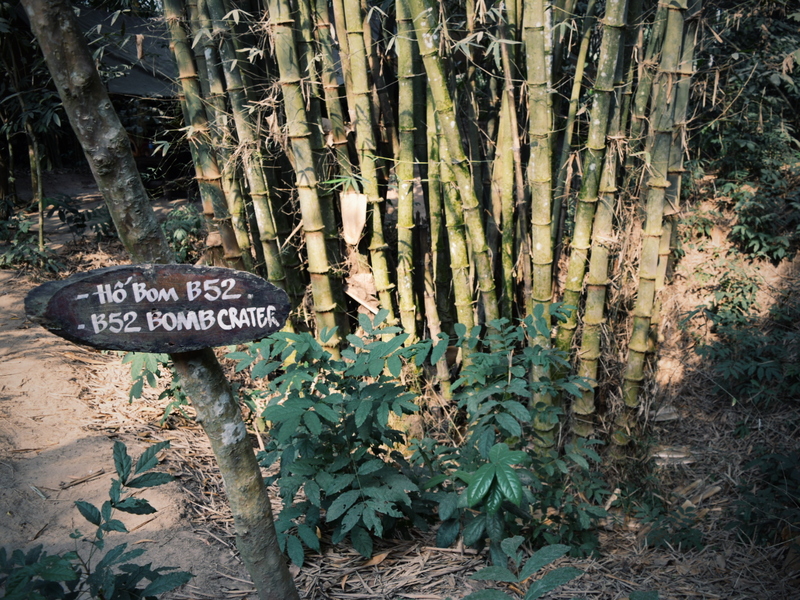 Bamboo cluster growing out of an old bomb crater. We’d been walking long enough that although I wasn’t hungry, I’d digested enough of our four course lunch to taste a bit of the tea and steamed tapioca root that a worker at the nearby rest stop brought out for us (seemingly included in the entrance fee, or maybe just with our package deal tour). Steamed tapioca with dipping plate. 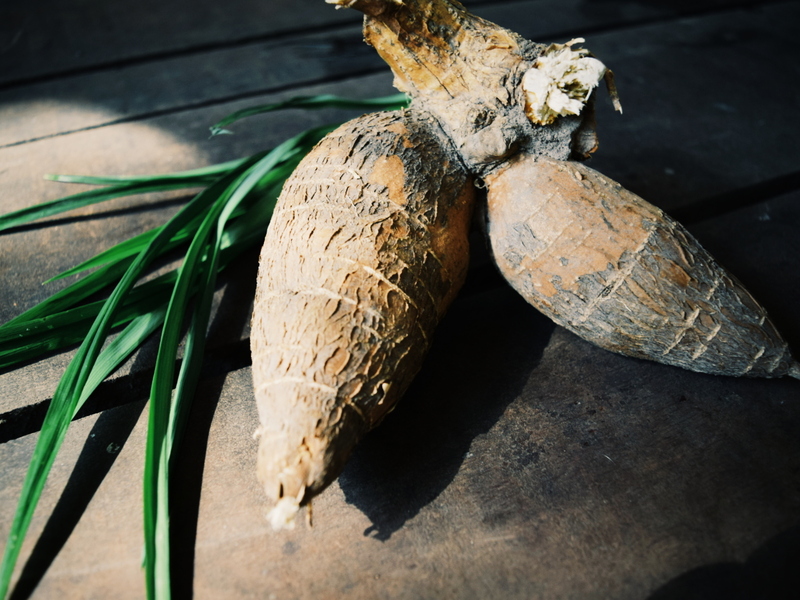 Accompanying tea made from the straight green leaves seen in the above picture of the fresh tapioca root. Can’t for the life of me remember what it was though. The tapioca had the texture of a potato but tasted like the pearls in bubble tea. Strange, but I liked it, especially dipped in the salt/sugar/peanut granules that accompanied it. The tea was wonderfully refreshing as well as it was starting to really heat up. After that our tour was more or less over. There were some buildings we stopped in – mock hospital dugouts, clothing manufacturing bunkers, weapons assembly pits, and even mess halls – but we were getting pretty beat by this point and didn’t linger long in any one. We stopped by the gift shop and saw the shooting range just behind it where – yes – real guns were being fired. This is where the sounds from earlier had been coming from. Ricky was also a sweetheart and bought me a pin for my pin collection when I was in the bathroom (I’d been too poor to buy it myself). Our guide chirped happily to us about the tour, asking if we’d liked it and we in turn asked her what her plans were for the rest of Lunar New Year’s Day. She really was an exceptionally friendly person and it felt so good to have a personal guide for the tour. Ricky and I later agreed that we wouldn’t have got 10% as satisfactory an experience if we hadn’t had her to show us around and give all the inside information. We’re not usually the kind of people who go for guided tours, preferring to do our own thing, but she really made an effort to get to know us and make us feel comfortable and then give us exactly the kind of tour we wanted. Even if the cooking class hadn’t been great, she would definitely have made the second half worth every penny. So the fact that every part of this tour was so incredible really made it memorable. A rare instance in travel when the more expensive investment risk really paid off. I really can’t recommend this tour enough. If you want the link the their website, click here. That’s all for now, folks! But tune in Monday for the next update. Have a good weekend! SO glad you went with the tour package. You really must read the book I was telling you about…when you come back here (“When Heaven and Earth Changed Places” is a 1989 memoir by Le Ly Hayslip). The interesting thing to keep in mind is that history is always told from the victor’s perspective. After the war, there was no choice but to learn the mantra of the victors if you wanted to survive. Everyone was suspicious of each other because of divided loyalties during the war. 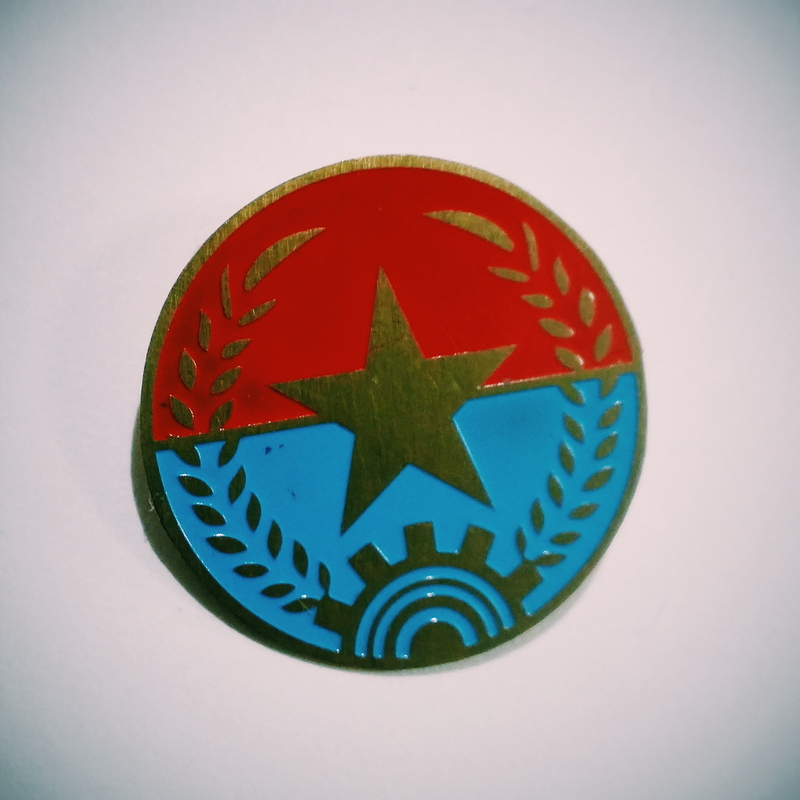 The capitalist South had to be integrated into the communist North once defeated, despite all their differences. It was harsh. Over a million people were imprisoned and a wave of refugees fled. 3 million people had died in the war already. The country was a disaster. It was necessary to unify the people into one way of seeing and creating the future. Teaching the next generations one perspective was key. It sounds like only the perspective of the Americans as enemies is shown. But to many they were allies, and a hope of keeping the South from being absorbed into the North’s communism. Because they lost, their story is suppressed and the other taught. To many villagers who simply wanted to raise family and crops and were caught in a tug-of-war, BOTH armies were the enemy. 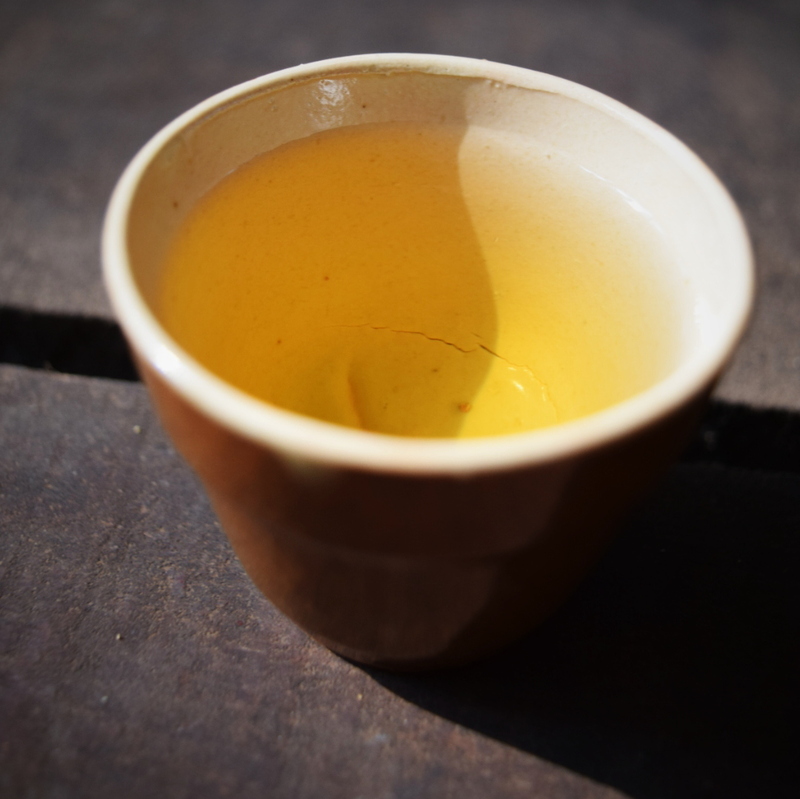 As per the straight leaves you made tea from…I think it might be lemongrass. 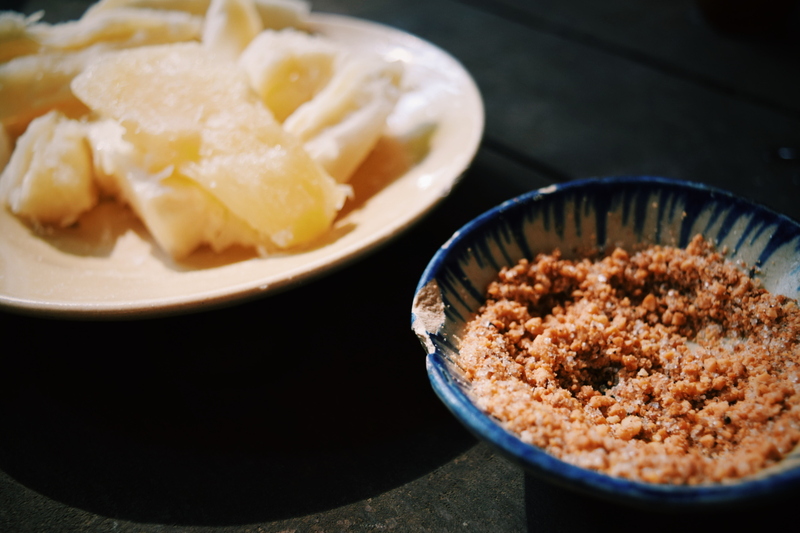 The tapioca sounds wonderful with the dip and tea. 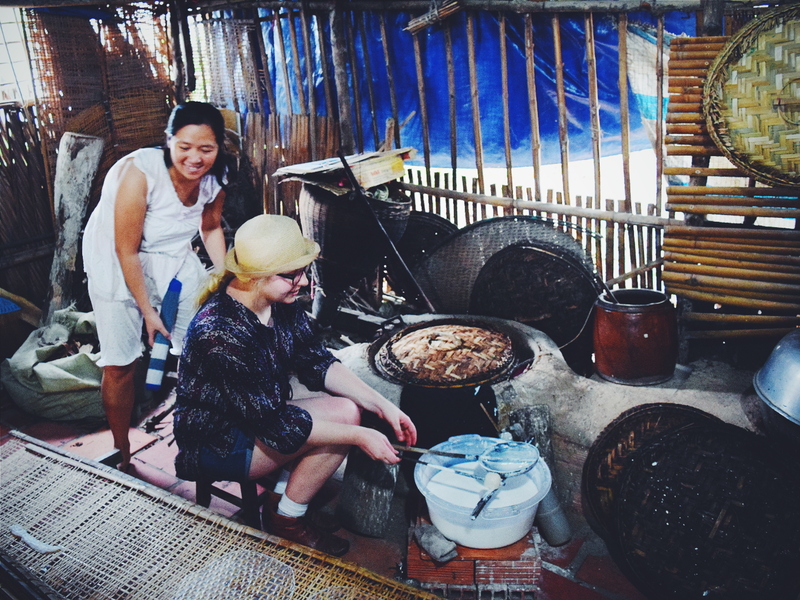 Watching you make rice paper, visiting rubber trees and exploring the tunnels is like seeing two kids eager to learn through hands-on field-trips from schooldays. I love it! Yes! Lemongrass! I’m pretty sure it was that. And it felt exactly like a school field trip. Haven’t felt that stimulated in so long. Such a great time. An adult version of Magic School Bus. I really have enjoyed reading these 2 recent posts. It also brings back so many memories of stories both heard and seen about the travels to that part of the world as well as those from the 60’s and 70’s. What an eye opening MSB adventure for the both of you and for us. You have wonderful story telling skills . 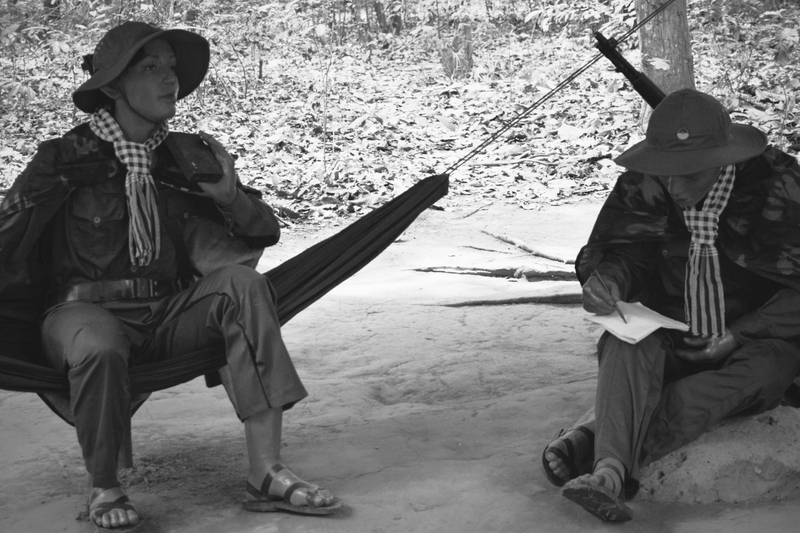 The accompanying photos really clarify many aspects of life in Vietnam. I’m so glad you’ve enjoyed them! MSB for adults it was, all the awesome included. Next up is Cambodia!